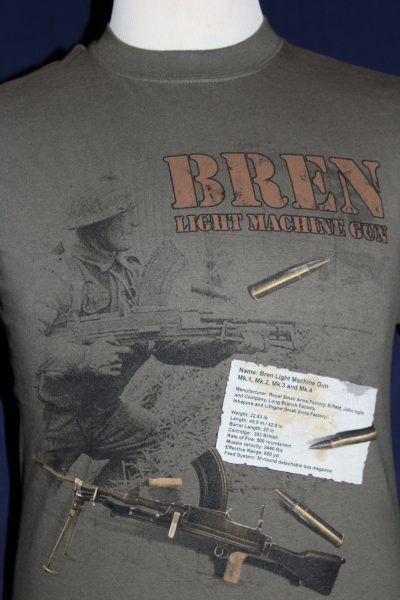 The United Kingdom Bren Light Machine Gun T-Shirt is a single sided print in olive green. Front Design Only: British soldier with Bren Gun. 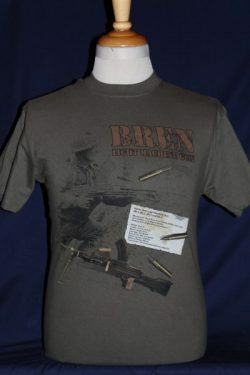 Statistics plate and ammunition with text. Famous light machine gun used by British, Australian, Canadian, and other Commonwealth troops during World War II. Hanes 100% preshrunk cotton; double-needle stitching throughout; seamless topstitched collar; taped neck and shoulders; This shirt will wear well and retain its original color and decoration after multiple washings. Note, we use the best quality preshrunk shirts available!